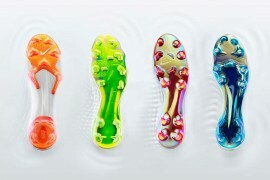 Nike are one of the undisputed masters of the tease when it comes to football boots. From sly appearances on training grounds, to unexpected match-day debuts – as such, it’s always worth keeping an eye on their adverts! And boy, did it pay off here! Serious props go to Maestro95, who was our tipster on this occasion – he spotted that on the current Nike France Away Shirt splash page on Nike Soccer.com is Florent Malouda wearing a pair of previously unseen White/Vibrant Yellow CTR360 II‘s! We’ve got to say, these new CTR360 II‘s do look like something seriously special, with the yellow colourway popping nicely off the white socks and white background. The CTR360 II hasn’t had a new colourway update since it’s launch in December, so it’s about time we saw some thing new from Nike’s ‘control’ football boots, and it looks like Nike aren’t set to disappoint. When will we see these new CTR360 II‘s on the pitch? Well, Nike are keeping this one close to their chest, but rumour has it we could be seeing these football boots very, very soon! What do you think of these cleats? Best CTR360 II yet? Or did you prefer the launch colourway? Drop a comment and join the debate! Can’t wait to get these, best colourway of the CTR’s so far. these look a lot like the NikeID CTR 1’s that young player had. I think a U17 player? I’m not sure of his age but i specifically remember reading about and seeing the pictures. Clearly Nike were paying attention to him! Not a bad colourway, the launch blue and black is my favourite. i switched from my ctr360s to mizuno’s wave ignatius because mizuno’s was much lighter and it too wraps its soft leather around my foot really well. 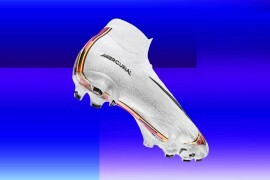 if i could wear the adizero leathers i wouldn’t wear the nike ctr360 either. 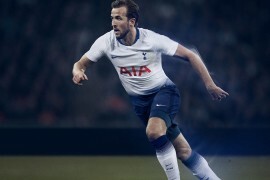 nike is in deep trouble – relying now on marketing gimmicks, the stars that remain and paint to save its bottom line. Cmon Nike, when we can make Nike ID boots for the Ctr 360 2. Gimme A black front, silver heel and red accents. 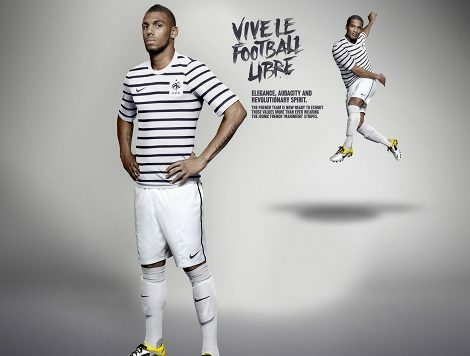 French kit is pretty close to looking like a prison uniform.. Saved by the the plain white shorts! Can a brother get a black colorway?